Your novel „Dearly Departed“ (Dark Love) has been out in Germany and stormed the hearts of readers. How in the world did you come up with a zombie-hero in a Steampunk-like universe? I think the two ideas were formed separately, but ultimately came together really well! The zombie idea definitely came to me first. I wanted to create a story featuring a monster-human relationship, and I wanted that monster to be true to his roots, truly monster-like, not some sort of paranormal paragon of Hotness and Girl-getting. I also wanted the relationship to build slowly and to be based on more than good looks. I love monsters of all kinds – I’m a horror movie fiend – and so it wasn’t hard to pick zombies as the „creatures“ to go with. I feel a deep sympathy for the undead, and thankfully I’ve been able to convey that to readers. As for the steampunk – well, that’s just me! 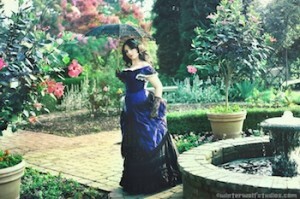 I love anything Neo-Victorian, steampunk, or anachronistic. I’ve always felt like I was born in the wrong century. So that was also a very easy road to take. Nope, I’m definitely alive and female! XD I attribute it to my personality – I’ve always had both ultra-female and ultra-male interests. I hate to talk about interests or personality traits in male/female terms – gender essentialism is so boring! – but it’s the easiest way to convey what I mean. I’ve always felt an equal amount of love for frilly dresses and big guns, romantic Victorian stories and explosion-filled action movies. I am both the sweetest, most submissive thing and a foul-mouthed, take-charge brute. My parents let me pursue whatever interests I liked, and so I never felt boxed in or judged – I love what I love, and I am who I am. I think Bram comes from the more „male“ side of my personality – but he’s not a foul-mouthed brute! Far from it. I wanted my hero to be capable, but I also wanted to balance that with intelligence and gentleness. I think too often we’re sold this macho, brooding view of masculinity, and I wanted Bram to be different. Sure, he can pump lead into zombie skulls when he has to, but he’s also really considerate and knowledgeable. Just like I think the world needs more strong female characters, I think it also needs more balanced male characters. Does the thought of becoming a zombie terrify you? How would you react if you were confronted with a similar situation as your heroine? The idea of becoming a zombie doesn’t frighten me, honestly – though of course the idea of dying disturbs me, as does the idea of infection. We’re all hardwired to fear death and illness, after all, and that instinct is hard to overcome. But at least if I were to become a zombie, I’d have a little more time – time to do something useful, to right my wrongs, to say goodbye the people I care about. I’d treasure that. And if I were ever put in Nora’s shoes? I’d have that door open in nothing flat! Like I said, I love monsters – I’d be on board before Elpinoy could open his mouth. I’d want to know everything about them. Kind of pathetic, huh? There is a significant difference between the dialogues of the people Nora grows up with and the zombies that she meets after that. When did you decide to differentiate the two societies through their language patterns? I don’t think they’re that different (maybe the language gained something in translation! ), but I think the zombie teens are definitely more chatty and sarcastic – gallows humor is a huge coping mechanism for them. And I imagine that the Punks are far less formal than the New Victorians, definitely – their society is far more egalitarian. I tend to visualize the NV-Punk tribal differences as a spectrum, though, rather than a set of rules – because there are poor NVs who live in the slums of New London, and gold-laden Punks who perhaps strive after good manners, and all sorts of people in between. It’s a huge, diverse world I’ve created, and I only hope that I’ll be allowed to explore as much of it as I want! At the moment you’re working on the sequel to „Dearly Departed“. Will there be a novel with older heroes one day? What’s in store for us Zombie-Fans? Yes, I’m working on Dearly, Beloved right now, which is amazing! I’d like to do an entire series featuring the Dearly clan, but we’ll have to see what’s in the cards. I’m working on a couple more YA offerings now – no zombies, but plenty of monsters. I won’t give too much away. As for adult stories – who knows? I have no plans to write an adult story anytime soon, but then again, I never thought I’d write D,D. On your website you try to watch every zombie movie ever made. How did you come up with that? It started as a joke (all of my major accomplishments start as a joke!) soon after I got my agent. Since then (2009, I think?) I’ve been attempting to watch every zombie movie ever, yes – which includes re-watching a lot of films I’d already watched, in order to fairly include them in my total. I’m past 100 now. I view it as sort of an anthropology project – I try to think critically about all of the films I view, even the most ridiculous ones, and tease out what they have to say about zombies socially, biologically, etc. It’s been really interesting thus far. At the moment zombies are crawling up from every corner in literature and graphic novels/comic books it seems. What do you think is the appeal of zombies? I think it’s because they’re human, and their fate is our own. I try to use the term „living“ as opposed to „human“ precisely for that reason – zombies are us. They’re just dead human beings. When you’re looking into the eyes of a dead man, you’re staring at your own future. I think that’s what makes them simultaneously so terrifying and so tragic, and ultimately so useful as metaphors. As for their current popularity – who can say? Aside from the fact that we live in uncertain, violent times and zombies are a fantastic way of exploring concepts like death and war and disease, of dealing with those concepts and achieving some catharsis, I think it might also have something to do with simplicity. During hard times we like to focus on simple things, look back on simpler times, even regress a little (brands such as The Muppets and Polaroid seem to be making a comeback, for instance) – and zombies are, whether evil or good, very simple creatures. They’re dead bodies, like I’ve said. Nothing more. The rules surrounding them tend to be far simpler than the rules governing other creatures, such as vampires and werewolves. They’re understandable – their pain, the fear they engender. They’re almost comforting, in a way. Since you’re interested in zombies, there is one Manga that might be very funny for you to read (or watch the cartoons): Highschool of the Dead. Even Sherlock Holmes is zombie-fyed (Victorian Undead: Sherlock Holmes vs Zombies). Do you read comicbooks? I love comics, but I haven’t read High School of the Dead yet! My current favorite comics are Ruse (both the original and the reboot – though I’m not sure if that will be cancelled or not) and Elephantmen. Elephantmen is one of the few comics to make me cry. It’s more adult, but I love it. But Alan Moore is my favorite writer ever, of course. What book is currently lying on your nightstand? I’m currently reading A Traffic of Dead Bodies: Anatomy and Embodied Social Identity in Nineteenth-Century America (I tend to read a lot of stuff like this – medical texts, body farm reports, etc.) and Mrs. Beeton’s Book of Household Management, which is a Victorian treatise on running a household and organizing servants, etc. I tend to read mostly nonfiction – getting me to read fiction is like pulling teeth. I’m not sure why my tastes have so drastically changed since I was a child, because when I was younger, I gobbled up fiction at an astounding rate. Which novels did you enjoy most? Even as a girl, I loved classics! Jane Eyre, The Phantom of the Opera (my favorite book of all time), anything by Sir Arthur Conan Doyle or Rudyard Kipling, A Little Princess, The Secret Garden, Alice in Wonderland. In fact, one of my favorite things to do is to buy lots of ancient, crumbling books off of Etsy and Ebay and read them instead of using them as decorations or craft supplies, as they’re intended to be used. I love reading dusty pulp novels, the paperbacks of their day. Sometimes you find hilarious things – like an entire novel that’s essentially glowing fanfiction about Lord Byron, from 1911. People never change! Thank you for taking the time for this interview. I wish you all the best and cannot wait for the next installment of Nora Dearly’s adventures.